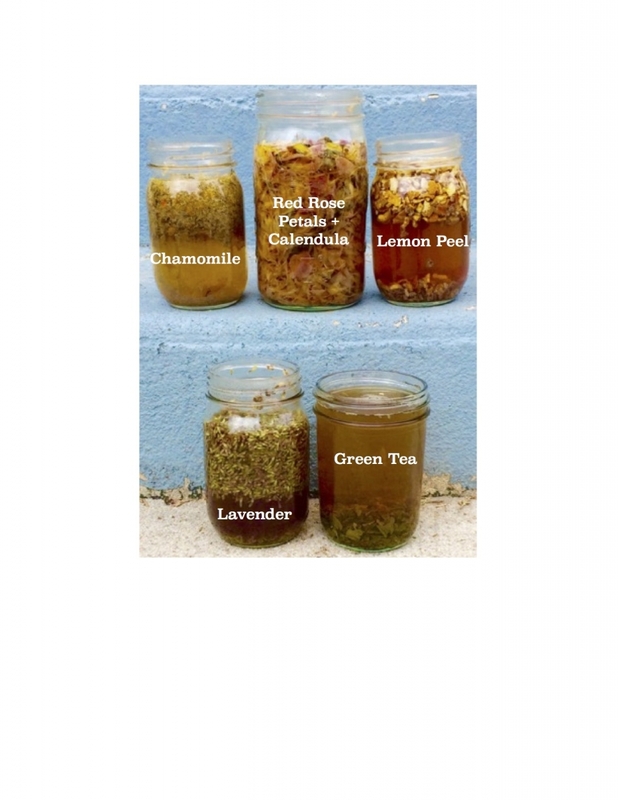 chamomile infusion: this is added to MeMe's Chamomile Toner for combination skin. Chamomile reduces puffiness, redness, cools and soothes confused t-zone skin. red rose + calendula infusion: this is used in MeMe's Rosewater + Glycerin Toner and her Bed of Roses face creme. Rose & calendula are both anti-inflamitory and moisturizing. lemon peel infusion: this is added to MeMe's Lemon Drop face creme for oily skin. Lemon Drop is a light and astringent moisturizer that will not clog over-producing, oily pores. It smells devine, too (lemongrass, juniper berry, frankincense). lavender infusion: ah, our good friend lavender. No day goes by with out someone in MeMe's household using lavender. Lavender infusion is the base of MeMe's Lavender Love face creme for combination skin. It calms and balances your mind as well as your skin. green tea infusion: this is added to MeMe's Green Tea toner for oily skin. Green tea is packed with anti-oxidants and is gently astringent to oily skin. Astringents should calm oil production, not dry like alcohol-based toners. Over drying oily skin confuses the oil glands and can make them produce even more oil, leading to more blemishes. No, thank you. ​So there you have it. Step one. We'll get step two, three, four, five photographed as well. Hopefully we can share those steps with you soon! I just had to drop a short note of thanks for the creation of your Lavender deodorant! I was using Toms before I found your deodorant in Idaho. Toms is natural but was only mediocre at best... I found your deodorant before Christmas and got a few to be stocking stuffers. It was odd at first to apply like lotion to my armpits. After 2 days of use, I am hooked!! I used it through a strenuous hike and was sure it was going to be like Toms and smell like sweat afterward. Not any bad smell at all!! I had a scare with a lump in my armpit that was, in short, caused by the heavy duty chemical deodorant. I swore off chemicals and have been working on eliminating what was in my cabinet. I love this deodorant so much, I am now going to look at your products for the face.. I am a very satisfied, happy customer for as long as you produce such great and natural products! Thank you Thank you Thank you! !